All CDT programmes have been created and are regularly updated by personnel currently employed Inshore and Offshore. Each course will be conducted by a training team that still works in industry, ensuring the accuracy of information presented, relevance of skills taught and safety operation of the dive site. 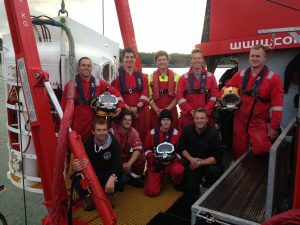 All meals and accommodation are INCLUDED aboard our bespoke dive support vessels during your training, from Sunday evening until Friday afternoon. There are NO additional hidden costs on our courses. All task training will be supported by CDT personnel currently engaged in the film industry. Small boat handling and basic seamanship are essential skills, so we introduce them early in the course programme thus give students maximum opportunity to gain experience. Students will also repeatedly dive virtually every equipment configuration/style currently being used in industry, mastering all. CDT instructional staff and ex-students have been involved in numerous media projects ranging from major features at Pinewood Studios 007 set and location shoots for films such as World War Z, Miss Peregrine’s Home for Peculiar Children and The Huntsman. We have also been involved in the BBC’s Natural History Film Unit productions such as Blue Planet, BBC’s Country File, Bargain Hunt, Poldark, Agatha Christie Films, Local and National News features, Discovery Channel documentaries etc. 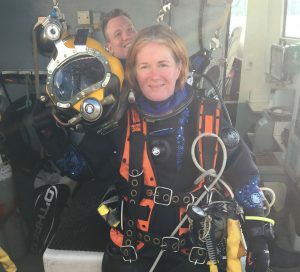 This first-hand experience and varied programme makes CDT’s Professional SCUBA course unique. Full details of the course content, requirements and certifications can be found on the HSE Professional Scuba Course page. Surface Supplied Diving Equipment (SSDE) provides the diver with an unlimited gas supply, allows reliable communications with “Top-Side” and offers the diver enhanced head protection. This system is therefore used extensively in the Inshore/Inland construction diving industry. CDT prepares students to gain employment as working divers, and therefore trains all personnel in an extensive range of tools and techniques as part of the Surface Supplied programme, again over and above the mandatory HSE syllabus. Hydraulic and pneumatic tools, air lifts, air bags, surface and underwater cutting and burning techniques, surface and underwater welding, surface and underwater rigging, inspection, construction and shipping is all covered within the 4 week programme, at no additional cost. Diving from a cage, surface umbilical management systems (SUMS), surface decompression diving and chamber operation will also be practiced extensively during CDT’s Surface Supplied programme. 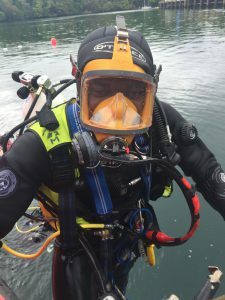 Full details of the course content, requirements and certifications can be found on the HSE Surface Supplied Diver Course page. The Surface Supplied Top-Up qualification is required by divers working within the Offshore Oil & Gas Industry and the Renewables Energy Sector. CDT’s Wet Bell system was only recently retired from North Sea use. It’s Launch and Recovery System (LARS) is fully Lloyds Compliant and could be mobilised onto the back deck of any Offshore Dive Support Vessel (DSV) tomorrow. CDT Offshore Top Up students will not only master the techniques of diving mid water in hot water suits from a wet bell, but will also carry out pre and post dive bell checks, drive the LARS and undertake relevant task training. The CDT equipment mirrors systems currently in use offshore, and are utilised throughout the one week course. Students generally undertake 2 dives per day during this module. Full details of the course content, requirements and certifications can be found on the HSE Offshore Top-Up page.